1. The Oakland City Council’s Public Safety Committee shot down a proposal from Councilmember Noel Gallo to institute a youth curfew in the city, the Chron reports. Three of the four members on the committee said they would not vote for Gallo’s plan, noting that the understaffed police department does not have the capacity to enforce a curfew. This is at least the third time in the past few years that the Oakland council has rejected a proposed curfew in the city. Previously, the council rejected similar plans from Gallo’s predecessor, Councilmember Ignacio De La Fuente. 2. 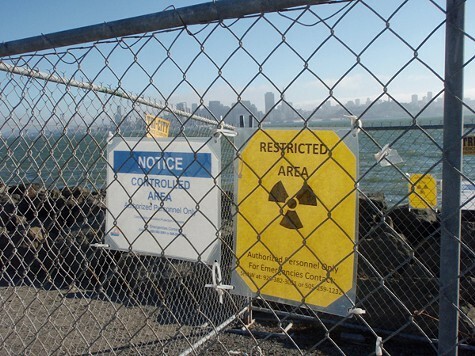 State health officials discovered highly radioactive shards on Treasure Island — including one object that could cause burns and hair loss if held onto for an hour, according to the Center for Investigative Reporting, citing a newly released memo from the California Department of Public Health. The area where the radioactive material was discovered was once part of the old Navy base and now features a playground, recreation areas, and apartments for island residents. The City of San Francisco also plans to build a new housing community on the island to add 8,000 more residents. 3. Twenty of the nation’s top scientists have signed a letter urging Governor Jerry Brown to impose a ban on fracking in California, the AP reports. Brown has come under heavy criticism for approving legislation in September that promises to greatly expand fracking in the state. 4. Legislation currently in Congress would overturn landmark laws in California that prohibit cruel treatment of animals — including the state’s ban on foie gras, shark fin soup, and eggs produced from chickens confined to tiny cages, the Chron reports. The legislation is being pushed by Iowa Republican Congressman Steve King and is backed by major agribusinesses that oppose California’s animal-protection laws. 5. And the Washington Post reports that the federal government’s problem-plagued Obamacare website is unlikely to be fully operational before the end of this month — as the president had pledged.